Hi Everybody! Brother.P here, and for the past few months, whenever I found some free time, I'd have to choose between painting models or continue on this a game board I've been making in secret. 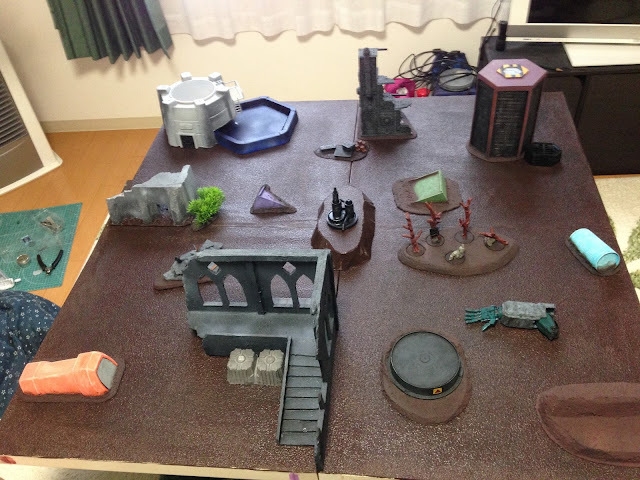 For lack of a better name, it's called the 'Japanese Folding Wargaming Board'. 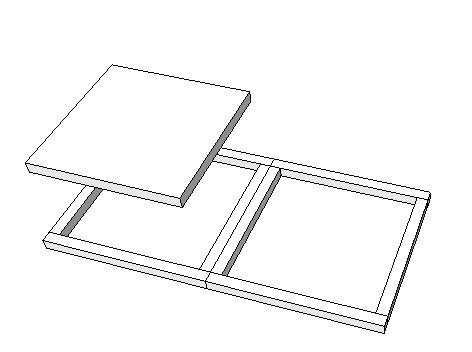 There is nothing inherently Japanese about my folding board design. 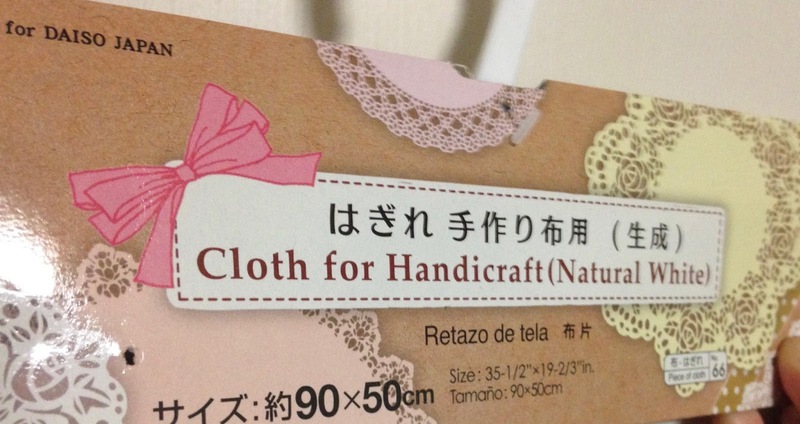 I am not Japanese, nor am I trained as a Japanese Wood Worker. It was made in Japan, and I sourced all the materials from Japanese hardware/dollar stores. The biggest Japanese influence on the board is my small living space, and why it needed to fold. I got my original idea from this article about making a portable wargaming table. I really liked the idea of using fabric as a hinge, rather than an actual metal hinge. 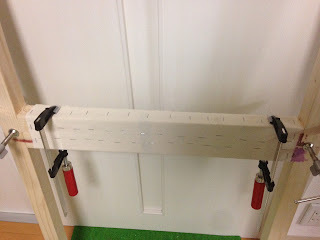 It meant that I could cut down on weight and that I wouldn't have to spend time looking for a hinge that would lay flat when the board folds open. I liked the idea that the top play-surface faced inwards when rolled up. And that when rolled out, the tension of the fabric across the top surface and the flat edges of each slats lying against its neighbour keeps the board straight. The idea sat around in my head for a while while I ruled out all the ideas that wouldn't work. 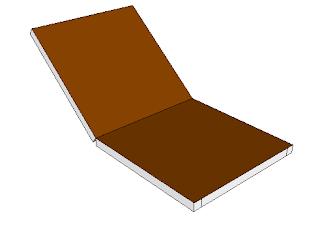 I settled on a 2 foot by 4 foot board section that folds in the middle. You can’t really play a game on a 2 foot by 4 foot board, but by making two I will have a 4 foot square board. I need to step away from the Imperial Measuring system. We use the Metric system in Japan (despite actually having an Emperor), so the rest of my project is in Metric. I've used 4 different types of glue for this project. My favourite glue is called Shoe Goo, I feel it's the strongest hold you can get, but it melts styrofoam and it smells awful. One area that make Shoe Goo stand out, is how it holds up to cold. Most glues become brittle in the cold, and as this board maybe stored in an un-insulated storage room, this was very important. I recently discovered that Shoe Goo is sold in small tubes that help you get smaller, more accurate blobs of glue. Styrofoam Glue is pretty good in situations where Shoe Goo would dissolve the thing you want to glue, but it takes a long time to dry and flows all over the place. Wood glue is good for strengthening the wood on wood joints. Typically the glue is a stronger than the screws, but it does not hold up well to torsion. For non-porous surfaces like the wallpaper or foam, wood glue wont do much good. 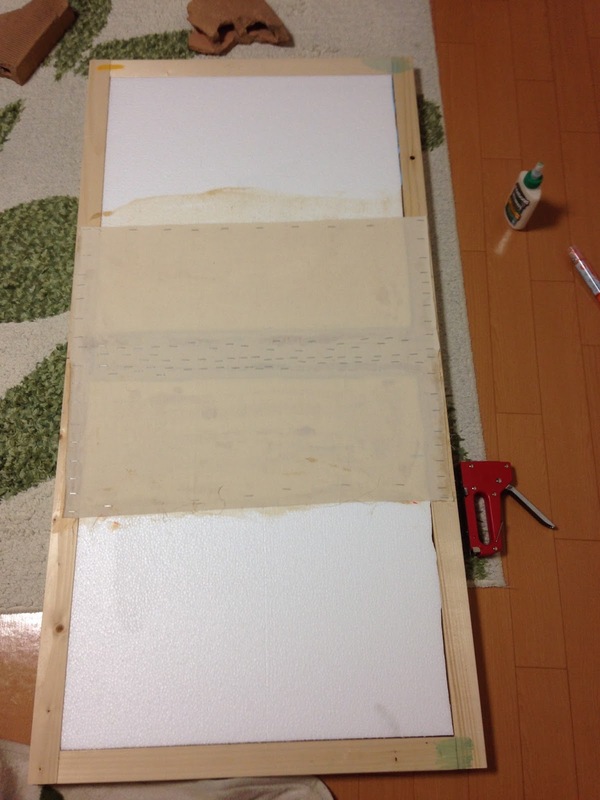 The wood glue was useful along the edges of the canvas, helping prevent it from unraveling over time. Lastly; the Glue Gun. It only holds up in certain situations. It's biggest weakness is the cold. It's great for filling gaps, but if the gun gets too hot, the hot glue will melt the foam, putting me right back with a gap to fill. 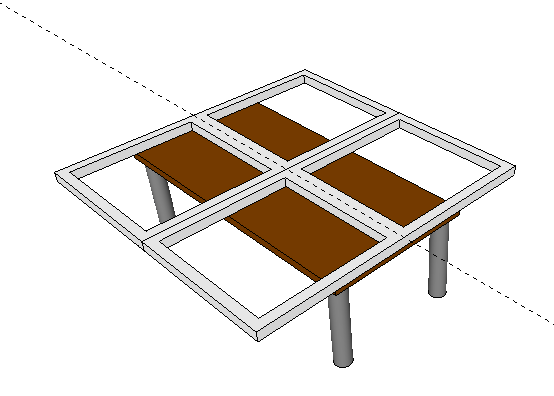 I took a 610mm post and a 530mm post and clamped them to my coffee table. I tried to make a perfect 90 degree "L", then drilled the holes for my screws. The holes you drill are never perfect, and unique to the two pieces you drill into. 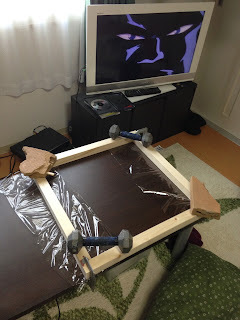 If you forget which two pieces go together, the frame wont be as straight. I painted each corner a unique colour after I drilled them to remember which two go together. I applied some wood glue, then fastened the posts together with a single Robertson screw at each joint. 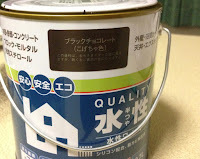 You can't buy Robertson screws in Japan, but before leaving Canada my father threw a handful, along with a driver, at me... as luck would have it, only 4 screws remained after I finished. 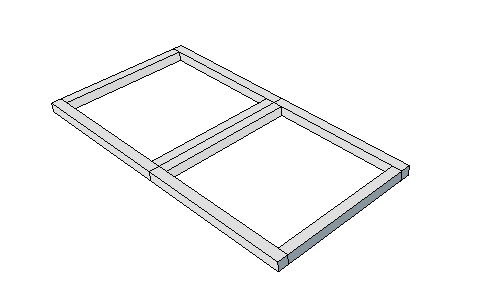 Once each joint is glued and screwed, and my square frame is together, I weighted down the corners on a flat surface. This hopefully would result in a frame that would be square and flat. 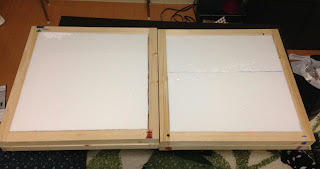 I needed styrofoam that would fit inside the wood frames. I think the most important thing I did before starting to build was finding wood stakes that matched the width of the styrofoam I had available. I stumbled upon these 40mm thick stakes that perfectly matched the 40mm thick foam that was available. Getting the foam was not my proudest moment. I bought the biggest piece available (1820mm x 910mm) and before leaving the store I pulled out my utility knife, and a paper template and just went to town. I made a mess of styrofoam bits, most of which were stuck to me. Lucky, upon leaving the hardware store it started snowing heavily so no one noticed I was covered in foam particles. 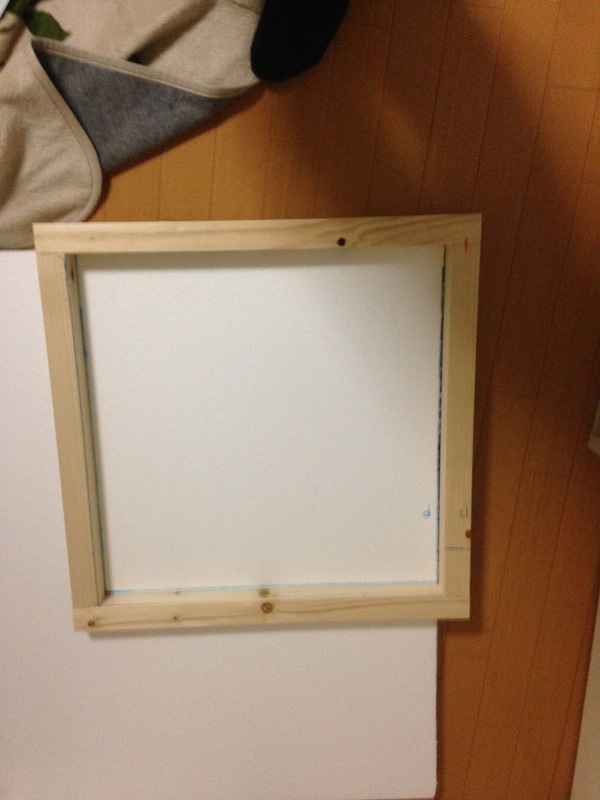 After I got the foam back to my house, I cut squares down to fit perfectly by using the wood frame as a guide. 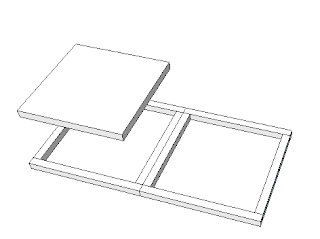 I drew lines on the front and back of the foam square. 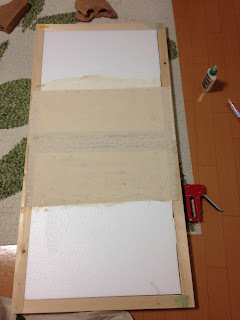 I ran some sturdy tape along the lines on the back and the front of the foam. This tape would keep my Foamcutter from veering too far off the straight line. Once the foam is cut, you need to hold off actually gluing it in place. "Look at me! I'm a square!" I was told to search out a good, strong fabric called Cotton Duck. I never did that. I found a dollar store (100円 shop) that carried pretty much the same thing. Unfortunately the max dimensions they sold it in were 900mm by 500mm. 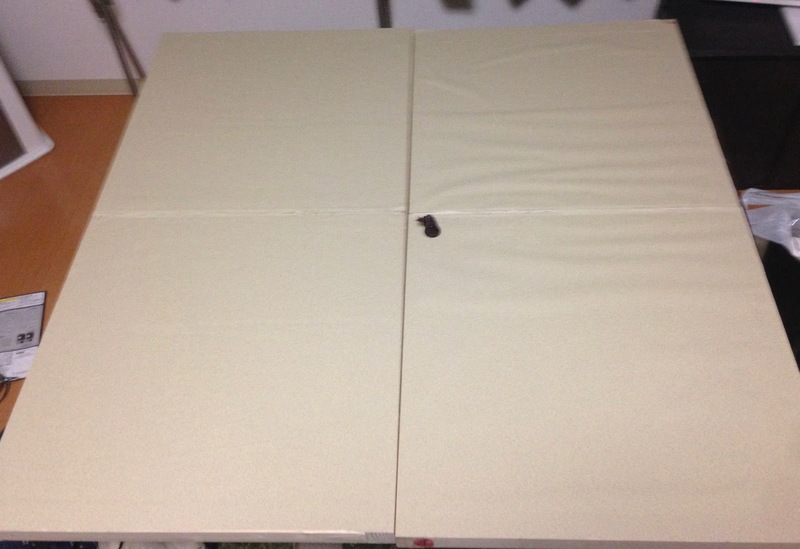 If you are considering making your own board, I'd highly suggest finding a strong canvas fabric that completely covers the surface of each 610 x 1220 board. The first part of the fabric hinge, was a small piece, ~ 500mm long and about 100mm wide. It wraps from inside one frame, over the gap where the two frames will hinge, then inside the other frame. I used Shoegoo to glue them down, then stapled it to ensure it was secure. I used a small amount of staples on this first hinge. The second piece of fabric that goes over this first 'hinge' will need staples anchoring it at the same location. With this first hinge finished, I squeezed the foam squares inside the frame. Cutting them precisely gives you a tight fit, which is good. Still, I wanted to use some adhesive to secure them. 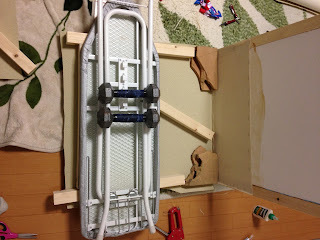 I used a bit of the styrofoam glue, then ended off filling any recesses between foam and frame with hot glue. Here's the second piece of fabric. It's first adhered with Shoe Goo anywhere that the fabric sticks to wood and Styrofoam glue anywhere fabric sticks to foam. I spat millions of staples at it to make sure it stays down. Occasionally, a staple would hit a staple bellow, so I ripped those out. I made sure all the edges of the canvas fabric were stuck down, by coating them in wood glue and pressing them flat. 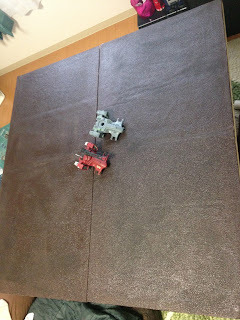 There is a popular textured wallpaper in Japan looks like a flocked surface, the moment I saw it, I knew it would be the perfect for the play surface of a game board. It would easier than gluing flock or sand, and it would weigh less. Unfortunately I couldn't get the wallpaper to glue down entirely flat. I blame the fact that my apartment was so cold, also I wasn't using typical wallpaper glue. I used about 12 tubes of dollar store Styrofoam glue. This glue takes a full 24hrs to dry and in that time my apartment fluctuated between warm and freezing cold, then warm again. All my terrain and bases are typically painted a dark brown colour, and I wanted the board to match. I wanted Latex based house paint, but at the hardware store I was only offered two option: Oil Based or Water Based. I went with water based. 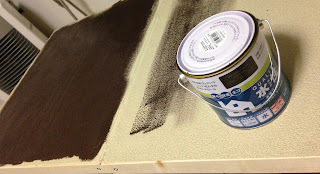 My big fear is that the painted surfaces of the board will stick together when it is folded up, then pull off the paint when it is opened again, but this board needs to be operational by February 25th, so I just pushed on. The paint dried very shiny, and tended to stick to itself when folded up. I finally decided to grind up a piece of charcoal and dust the entire top with charcoal dust... it wasn't the best idea but I was quickly running out of options. I don't really want to go through making another board. Between each step there was a lot of waiting for glue to dry. As it dried it would eating up a ton of space in my apartment, so I constantly had to be folding it up and putting it away. If you add up the costs in the materials section, its well under $100, but that's because I'm lying to myself about the amounts I was willing to pay for some of that crap. There's no way I'd work out of my tiny living room again. If I ever do make myself another folding board, I'd like to try making a Zone Mortalis board. There is no way in hell I'd even consider it unless I've got a house to work out of, though. If I lose a certain painting challenge and am ordered to make this... my life will likely fall apart as a result. So Mr. Pink, I beg you, do not order me to make you one! That is quite the project. Well played. Thanks! I learned a lot from it. 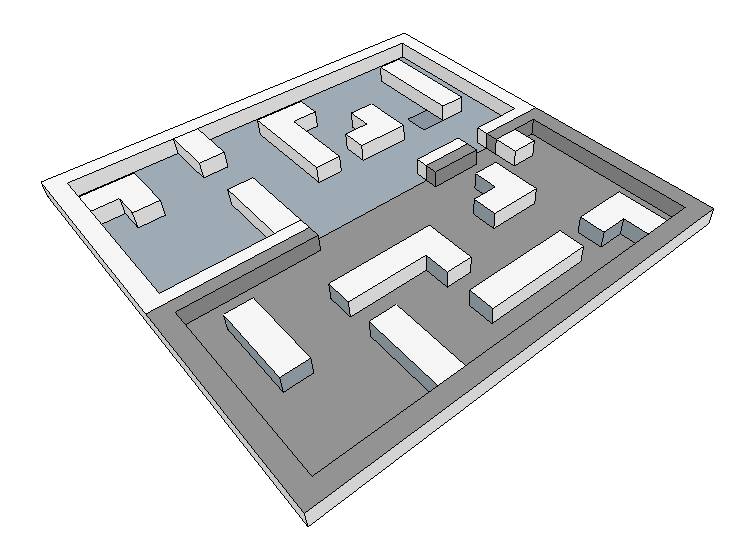 Wow, this is a really neat project! I always kind of wondered what the wargaming scene was like in Japan. Have you gotten to use the board in some games? In the finished picture, you have a robotic arm used as terrain. Is that part of a Transformer? ... in my city, the Japanese 40k group plays a single massive game each month. I've been turned off from joining because it seems chaotic. Might show up when 8th picks-up, though. I played a game on my 4x4 and immediately realized I needed to bump it up to 6x4 (Chaos ran 60% of my models off the table edge). The plan is to add 2'X4' boards on either end. The robotic arm is from a series of 1/35 scale Gundam model kits (HGUC Anti MS Squad). The whole thing can go together without glue and remain fully articulate. Also the kit can be built as either left or right handed. It might be out of production, but if you're interested in getting one, they show up from time to time, so I can keep an eye out. They retail for about $28 US. Instructions are not in English. I could see the reluctance to get in on a massive free-for-all game. 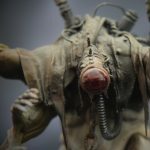 But, the start of 8th edition probably would be the time to start playing more often! Who knows, maybe the 8th edition will be the excuse to get me playing the game again (one of my brothers only lives an hour and a half away, so I could certainly play with him). I am not sure that I played a single game of 7th edition. I did not realize that they made Gundam kits with crew members that were not in the "anime" style. I have a High Grade Iron Blooded Orphans mobile suit kit sitting on my desk right now. I got the urge to try to build one like 4 months ago, and I never got around to assembling it.